An island with history, red dirt roads, stunning beaches and pepper farms. Once I reached the south of Vietnam, I knew I wanted to explore the rural areas instead of just staying in and around Saigon (a.k.a. Ho Chi Minh). Cities are fun, but the best of Vietnam is definitely in the countryside. We were told of an island that was about five hours away, so after just three days in Saigon we booked the bus and a ferry and headed off the next morning. Phu Quoc (pronounced 'foo-wock') sits directly south of the Cambodian coastline but it is Vietnamese territory. With an area of about 570 square km, it's been in the middle of a tug-of-war between the two nations for many years. The island is a wonderful and rich with culture and natural beauty. We went there during a five-day national holiday and were warned about how busy it could be, but not in my whole 10-week trip through Asia did I find a place so empty of other tourists, Vietnamese or otherwise. It was a welcome change from the frenetic pace and noise of Saigon. 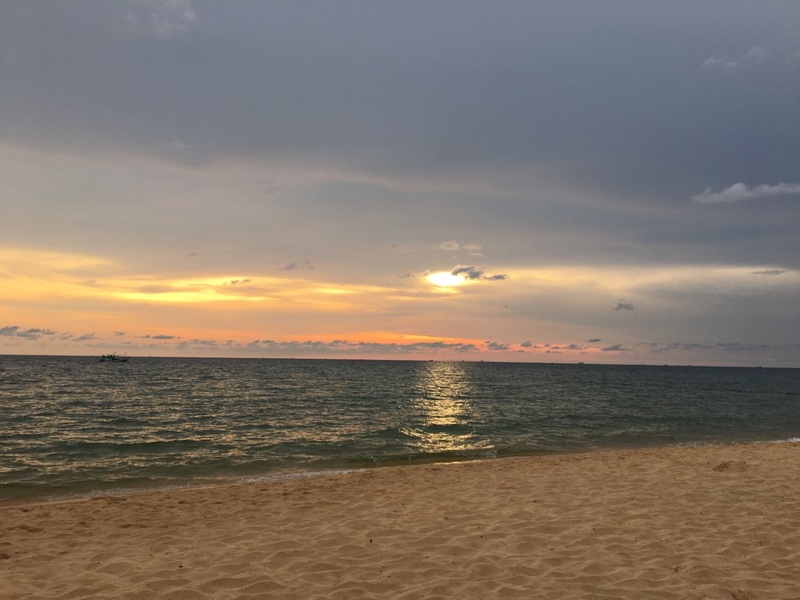 Phu Quoc boasts some exquisite beaches, but it also has so much more to see and do than those isolated beach 'paradises' in the south of Thailand. After you arrive in the ferry port on the northeast side of the island, you have to get a taxi to the other side. We did our usual thing upon reaching a new place of turning down the two dozen taxi drivers asking 'where you go? ', sitting down, checking our map, realising we need a taxi and then going back to accept their offer. We were staying in a hostel in Duong Dong, the island's central town that sits halfway down the west coast. It has some nice bars and restaurants, but the real joys of Phu Quoc are found in the spaces between the towns. The island was pretty easy to make heads or tails of: it's basically a long, triangular shape tapering off to the south. After dumping our bags, the first thing we did was hire scooters, pick a random direction (south) and drive! We joined the very wide highway that runs down through the island. It was thrilling simply because it was so empty. For several long stretches we didn't even see another vehicle. It was perhaps a little wasted on me as I don't drive very quickly, but my reckless friend loved it. Ironically, it would be me who crashed his scooter in Phu Quoc and got a bloody eye! I've noticed that when white tourists hire scooters they tend to do the same thing: zoom around with no particular place to go, searching for side roads and obscure trails. My friend and I did just this, moving south but hugging the coastline and looking for any road that would take us off the highway to somewhere quieter. We did eventually find a side road that started off well but became increasingly narrow and sandy. We ended up at someone's house, complete with two staring children and a barking dog. It turns out I can drive quite well when I think there's a dog after me. As we made our return to the highway, we passed two more pairs of white travellers on scooters, heading the way we had just come. They clearly had the same intention as us. We waved them back and told them to turn around. I wondered how many disappointed white visitors that family gets each year. We reached the island's southern tip and discovered the fishing town of An Thoi. After one minute of exploration, we realised we had made a mistake. An Thoi is not a town for tourists. There was nothing there for us. In searching for a beach, we found the fishing port - a heaving, crashing, dusty place where we definitely didn't belong. Then we realised that most of the town was heaving and crashing. Road works everywhere, traffic, noise, all in the searing heat. We even struggled to find a place for lunch, finding three cafes in succession that served only drinks. My friend was eyeing some chicken being grilled on the street by a couple of women, and he was about to get his money out when the woman frowned and we realised that they were just cooking it for themselves. Zooming out of that town on scooters would have felt fantastic if it wasn't for the choppy, bumpy, almost unnavigable roads we had to drive on to get out of there. Phu Quoc had its share of involvement in the Vietnam war. The Southern forces constructed a prison in the southeast of the island in which to hold Vietcong captives. We paid a visit to the prison after we left An Thoi. As the saying goes, 'history is written by the victors', so any museum about the war that has been curated by the Vietnamese government has to be taken with a pinch of salt. Nevertheless, the war was a horrendously cruel period for the country and it was easy to believe most of the claims made by the museum. The prison still looks pretty much as it did fifty years ago. Sheet-metal huts in long rows, tall fences topped with barbed wire, watchtowers and, most evocatively of all, absolutely eviscerating heat. We walked around the prison in the same temperature as that experienced by the real inmates. The inside of each hut felt like an oven. The curators had populated the prison with life-size models of Vietcong prisoners. The guards used to punish inmates by putting them in 'tiger cages' - cramped, wire cages placed outside in the sun. The cages were still there and they each held a life-size model of a prisoner. The use of these models made the prison's portrayal of violence very sombre and powerful. Even off the mainland, Vietnam's difficult past still casts its shadow. Our exploration of the island continued for another couple of days. We found a side road covered in spectacularly red dirt. The dust thrown up by our scooters looked brilliant. The road took us to a magnificent beach on the northwest coast. It was almost deserted, and we discovered it in the late afternoon just as the sun was starting to descend. 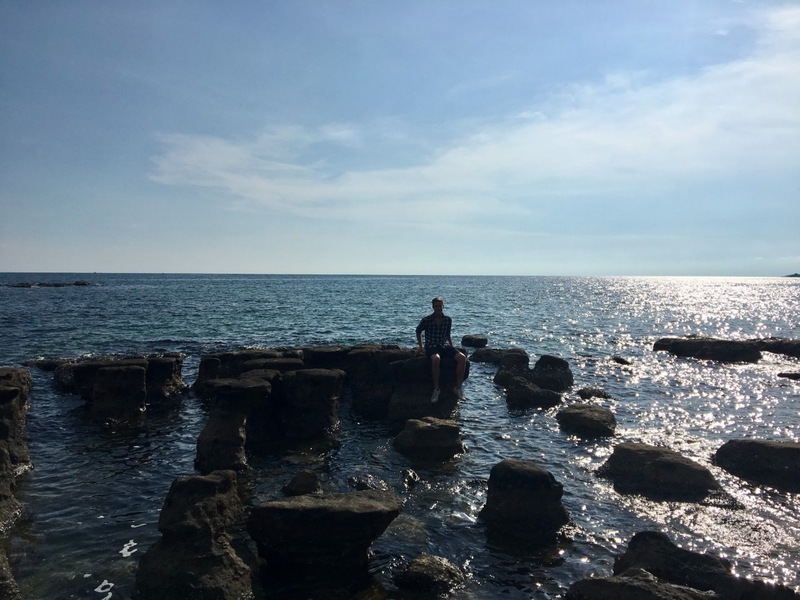 The sunlight was glancing off the water to the south where we found a huge cluster of rocks jutting out of the sea. It was a captivating place and we didn't want to leave. We were very thirsty, so you can imagine our relief when we saw a hut set back between the trees and found a family there. They sold us a few cans of sprite and we drank them while sat on the rocks. We could tell that this beautiful beach was destined to become colonised by parasol-peddling beach bars, so we were happy to be here before the transformation began. However, the most interesting thing about Phu Quoc was its local food industry. 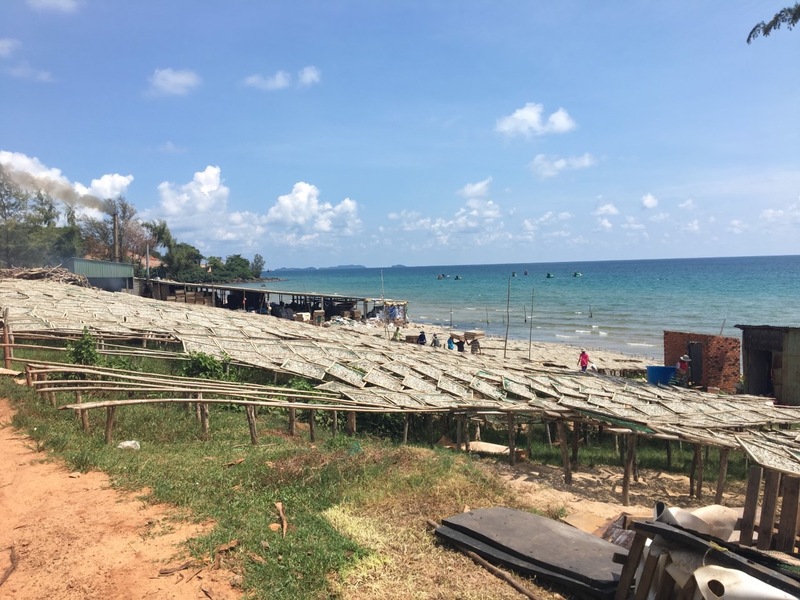 It turns out that the island is famous in Vietnam for its fish sauce and its peppercorns, and we were lucky enough to see both of these industries in action. On one of our scooter drives along the coast, we turned a corner and were suddenly hit by a very strong smell. To our right, sloping down to the sea was a mass of silvery fish. There was tray after tray of anchovies just sitting and drying in the sun. The scene was something to behold. People were lining up to add more trays, carrying them on their heads from the boats. We later learnt that they were making Phu Quoc's famous fish sauce. This gave us a taste for more of the local culture, and our visit to a pepper farm was the best thing we did on the island. 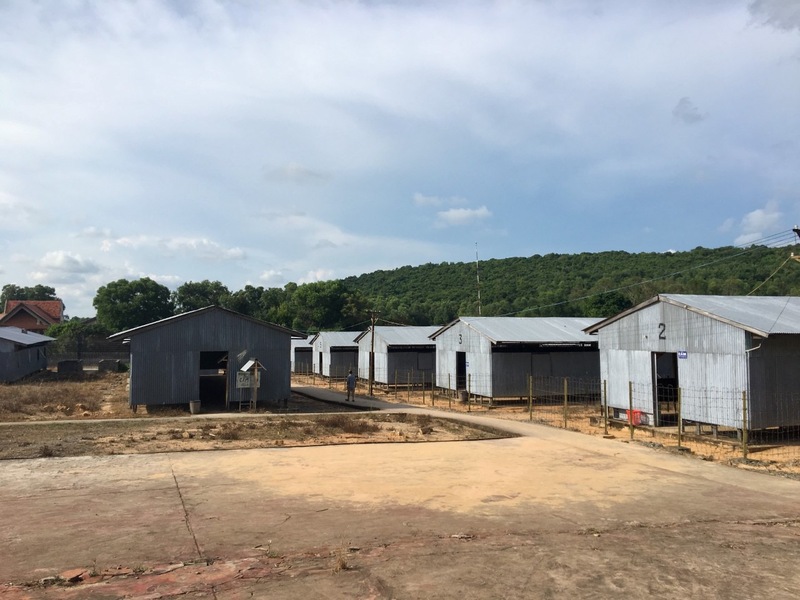 We'd heard great things about the 'Phu Quoc Countryside' farm in the northeast. I arrived with a bloodied eyed, having crashed into a thorn bush on my scooter the hour before. We had no idea what to expect at the farm but we were pleasantly surprised. A very friendly Vietnamese girl called Alice greeted us and asked if we would like to start the tour. We didn't know anything about the tour or how much it cost but we said yes anyway. Alice spoke very good English and she taught us so much about the farm. We picked and ate green and red peppercorns - I learned the hard way that green peppercorns are VERY spicy. 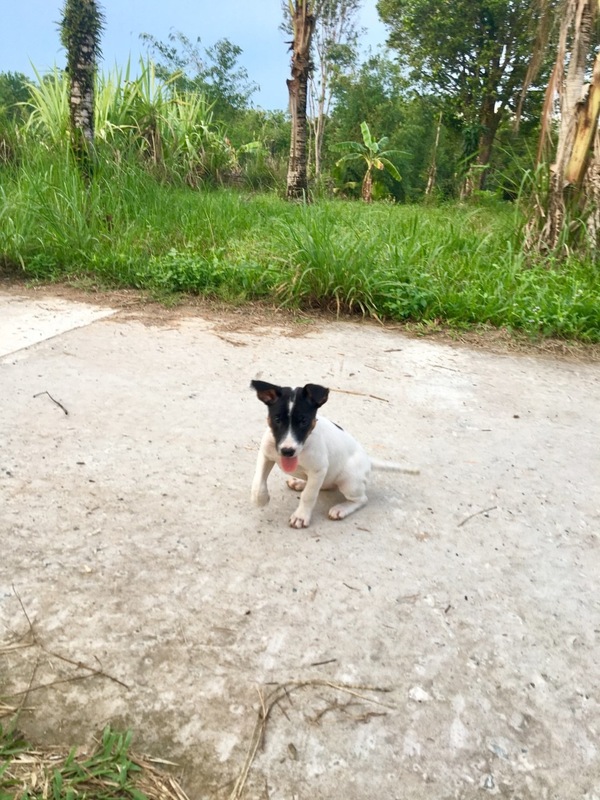 A little puppy joined us for the tour, which I thought was delightful (I fawn over any dog). Alice had found him a few months ago, abandoned in the jungle, so his name literally translated as 'get lost'. However, Alice swiftly took him away. I was devastated and Alice said, by way of explanation: 'it likes shoes'. I later discovered she was right to take him away. A couple more dogs and a chicken then joined us, so our tour group got pretty large. After the tour, Alice gave us some of the farm's produce to try: Vietnamese plums (very tough and bitter), pepper tea, orange juice (both delicious) and some sweet potatoes (the best of all). We tried to pay her something but she insisted that the whole thing was free. All she wanted was a good review on Tripadvisor. Alice had come from the Mekong Delta on the mainland and she was here as a volunteer. She said that she had never even seen a city before and had no intention of doing so. Her kindness toward us was humbling and it felt so wrong to leave without paying. We made sure we each bought something from the gift shop. The farm is a magical place, totally surrounded by jungle and it's well worth a visit. 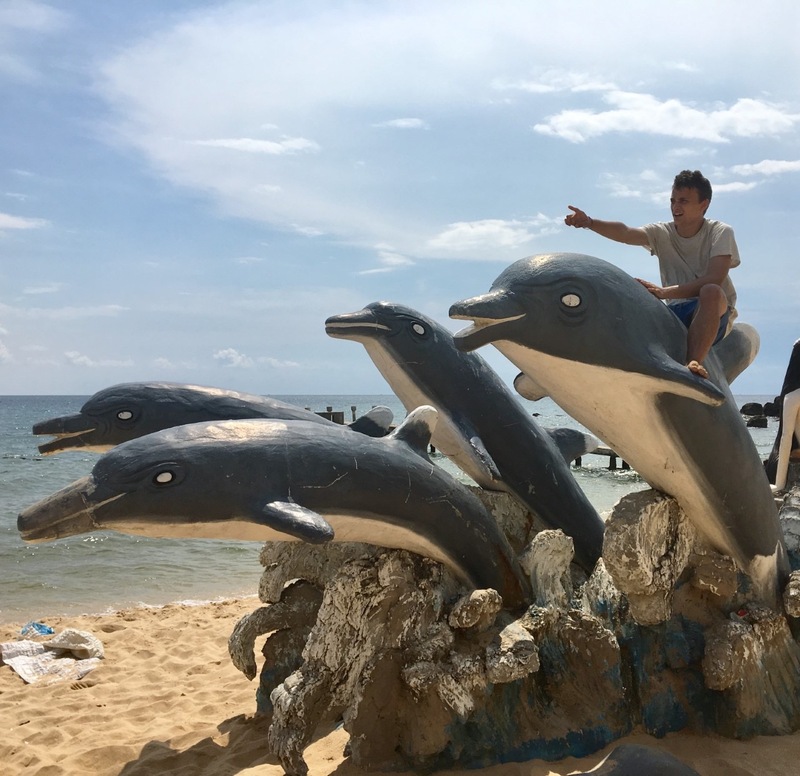 We even saw dolphins in Phu Quoc! 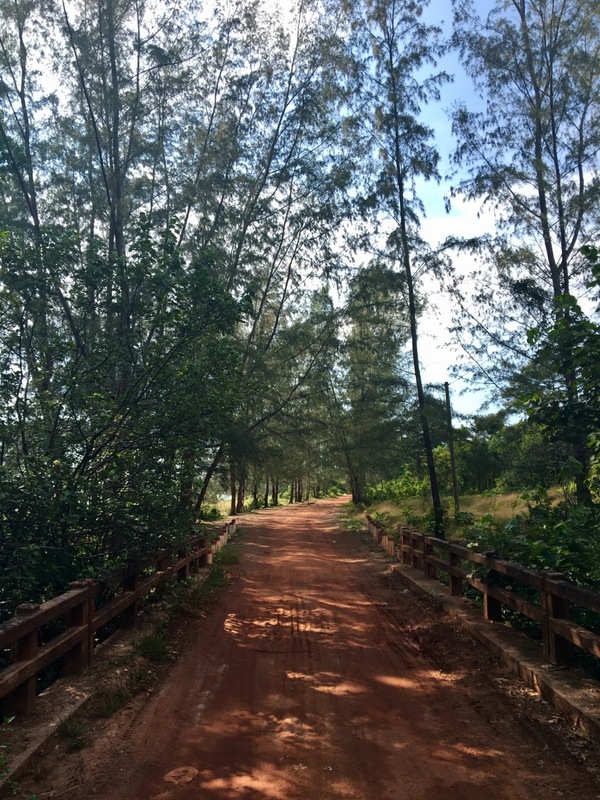 Phu Quoc has a bit of everything; culture, history, food, beaches, adventure. Peaceful towns and noisy towns. Its pharmacists are pretty handy with iodine and a bandage, too. 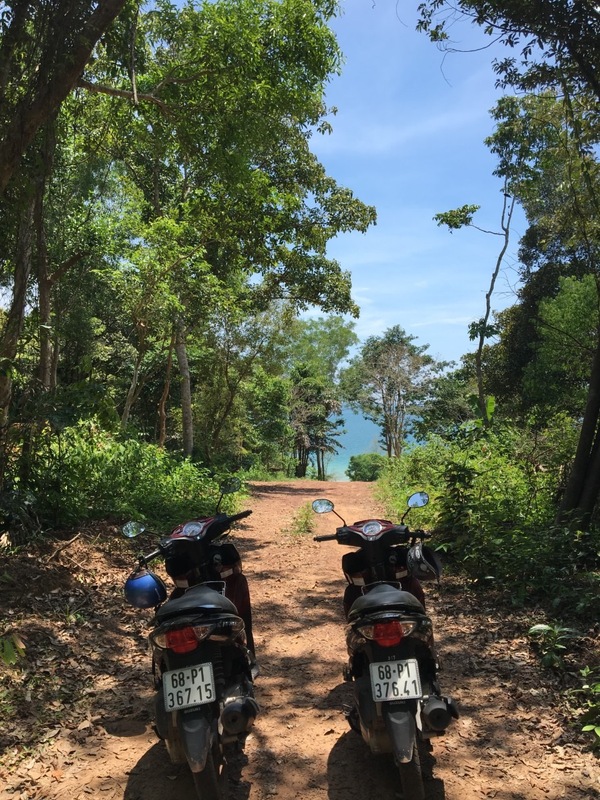 The best meal I had in Vietnam was a spicy seafood hotpot in Phu Quoc's Duong Dong, and my favourite Vietnamese drive was along the island's red dirt roads to the northwest. While most people who pass through Saigon get their rural fix in the Mekong Delta, I urge you to go a bit further and see Phu Quoc.